Cardiff Rivers Group Blog: Hot fun in the sun! On a hot and sunny summer’s day, 22 volunteers from the Cardiff Rivers Group and Friends of Bute Park took part in a joint event in Bute Park. The aim of the event was to litter-pick the banks of the River Taff, remove Himalayan Balsam and remove rubbish from the Taff itself. As there has not been any significant rainfall recently, the river was low, revealing a number of unsightly items that would normally be hidden. 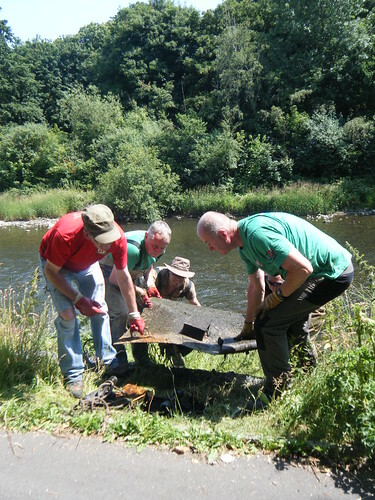 A team of volunteers worked up a real sweat as they clambered through the river in rubber waders to retrieve heavy metal items which then had to be hauled up the banks. The volunteers also pulled up a significant amount of Himalayan Balsam from the river banks. During the event, 16 bags rubbish of rubbish were collected, along with 4 bikes, two cones, a lawn mower, a huge orange plastic pipe, two broken trolleys, 2 lengths of plastic road barrier and a considerable amount of scrap metal including a 5ft * 4ft steel door! Unfortunately, after the end of the litter pick, two of the bags of rubbish were thrown back in the river. Luckily, Richard Weaver from Keep Wales Tidy spotted the bags and was able to recover them on Monday morning to stop them from drifting down the Taff. You can see more pictures from Sunday's event on our Flickr page here. Group Treasurer, Dave King said, “It was great that 22 Cardiff residents gave up a glorious hot and sunny Sunday morning to yet again improve the quality of the environment we live in. With the river so low the opportunity was taken to tackle larger items out of the river and with colleagues from Friends of Bute Park to tackle invasive Himalayan Balsam. A really good effort”. All waste was collected by Cardiff Council Parks Services.